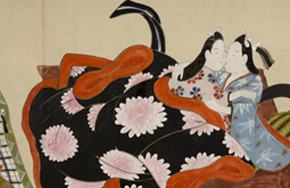 One misunderstanding that shunga has helped to clarify is whether the figures depicted in an artwork are men or women. Surprisingly, the answer is often "neither." Many scholars now propose the existence of a third gender during early modern and pre-modern Japan -- biologically male individuals whose appearance, use of language and mannerisms were neither masculine nor feminine and who had sexual relations with both men and women. Art historical texts often describe these individuals as "young men" or "dandies," but in this exhibition, they are described simply as wakashū, categorically distinct from both women (onna) and older biological males (yarō). Wakashū can be identified most easily by their hairstyle. While yarō shaved the tops of their heads completely, wakashū shaved only the back half of their heads, and their forelocks remained intact. Sometimes wakashū covered the tops of their heads with brightly colored, brimless caps. Another signifier of wakashū was their long-sleeved kimonos. 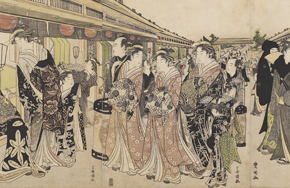 While the idea of a third gender may sound like an obscure oddity of early modern Japanese culture, wakashū were in fact extremely popular and played active roles in Japanese society, particularly in samurai communities, Buddhist temples, and Kabuki theater. Images of wakashū can be found throughout this exhibition as well as in other Japanese artworks this museum regularly shows. See how many you can find -- the frequency of their appearance may surprise you!